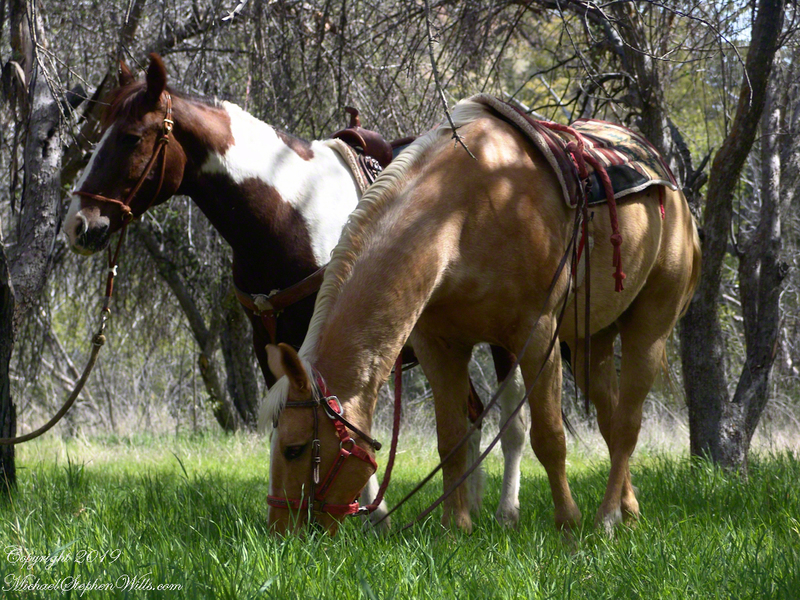 Nugget and Colorado had eaten their fill of the rich early spring grass of the apple orchard, The Searcher pulled together the pair for the return to Pine Creek. Perched on Colorado, the lead held by The Searcher, I listened as he shared survival facts remembered from Peter Bigfoot’s desert survival course. The Reavis Mountain School of Self Reliance, founded 1979, is along same Reavis Gap Trail (#117) we traversed. After descending to Pine Creek and up to Reavis Gap (where I first met The Searcher), it descends to meet Campaign Creek where the survival school is located. He pointed out on the many flowering Century Plant stalks along the trail. “These are great to roast when young, just as the stalk starts to bud from the center, before it starts to lengthen.” By the time the stalk flowers, as in the following photograph, it is quite tough. 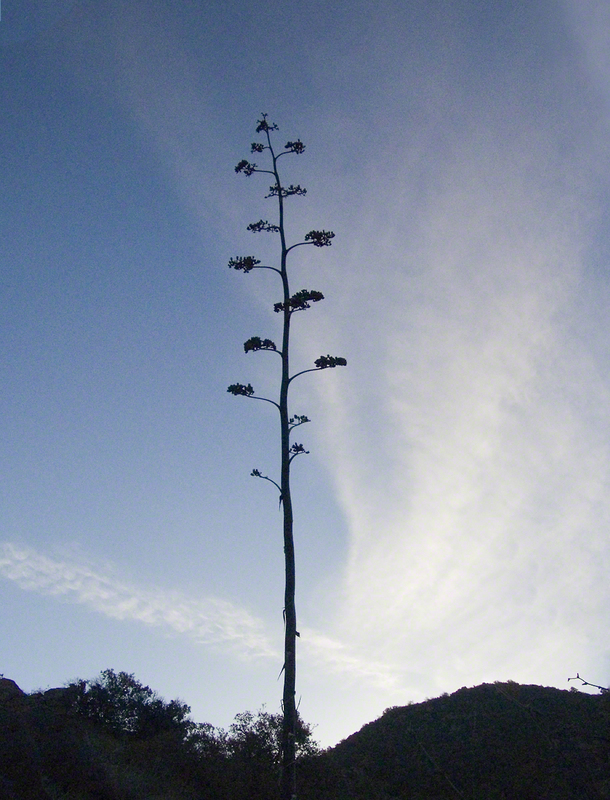 Agave flower spike against the dawn in the nameless canyon west of Two Bar Mountain, Superstition Wilderness, Arizona. At the base of boulders, shaded from the sun, the ridgeline fern takes hold. Surviving on seasonal water seepage, it dries out during dry spells to later revive and reproduce via spores. As I recall, the dry or fresh form is useful as an analgesic. An absolute necessity for bushwacking (walking off the path), a pair of rattlesnake proof boots were worn on every expedition. These rose to mid-calf with a layer of lexan, the same as used for bullet proof glass. 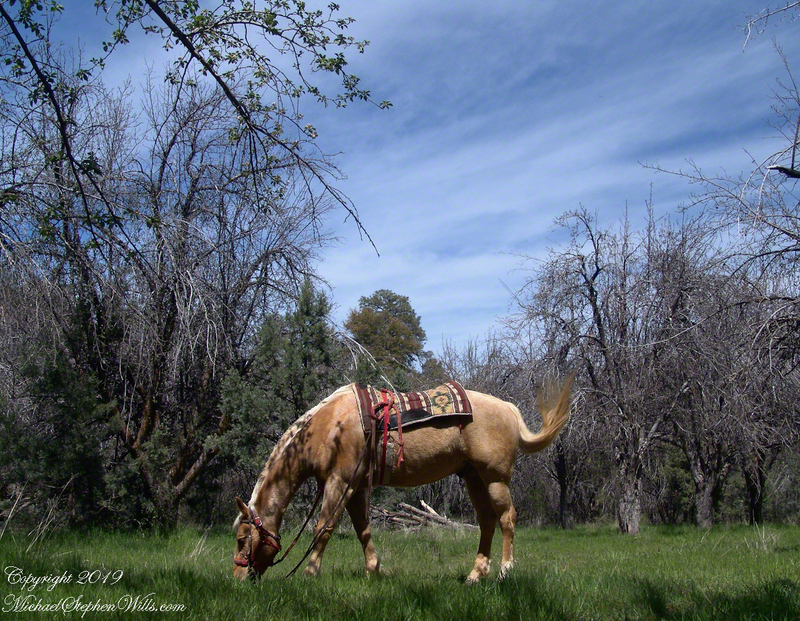 We passed the time in this way, me holding on to the saddle horn bouncing and shifting as Colorado negotiated the rough and steep path down to Pine Creek where the vegetation changed from very sparse to the thick growth you saw in my post “A Peaceful Day at Pine Creek”. On the east side of Pine Creek a trail, unmarked on the maps, follows the creek bed uphill north towards Mound Mountain. In 50 feet or so we passed the side trail to my campsite, our destination was The Searcher’s campsite. 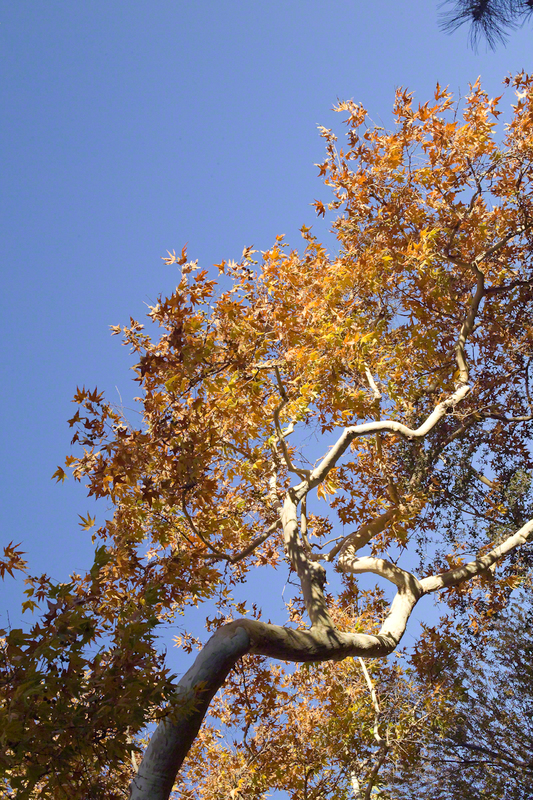 I was not paying near enough attention to the surroundings when I looked up to see an Arizona Oak limb headed to my chest. With no time or space to negotiate the obstacle I was left to grab hold and hang on to be swept from the saddle. The branch held my bulk for, at most, a second before giving way. In bending flexibly before breaking the live Oak wood and centuries of soil underneath the trees softened my fall enough so I was badly shaken and unhurt. Falling a foot or so in any direction would have resulted in serious injury or instant death. Colorado stopped, looking briefly back as I slowly came to my feet. After taking account and letting the circumstance wash over me, I got up and proceeded slowly while we both contemplated my miraculous survival. I now took up the rear as in a few hundred yards the valley wall rose on both sides of the Creek to form a short, narrow pass. The walls fell away just as quickly, the valley floor leveled out and we came to The Searcher’s camp. The bear shelter stood out right away. This was a ten foot high teepee of 4 – 6 inch diameter tree trunks tied with rope, within was a hammock . The three foot wide opening left only one unprotected side while he slept, offering some protection from the all too common roaming bears, most commonly from September to November when mazanita fruit ripens. Well stocked in every respect, for a wilderness camp. In the following years of roaming the wilderness the camps of other horse people were similar in this way: stoves, comfortable cots, radios, pots and pans all fit into panniers. As a noun pannier is seldom used in the singular because there are always two, one on each side of the horse for balance. I sat on the wide top of one enjoying a cold beer pulled from a bed of ice. We discussed the benefits and drawback of horses for exploration. I required a gallon and a half of water daily and in the desert wilderness provided for storage of three days, 4 and a half gallons. At 8 pounds each, that is 36 pounds!! Starting out, my pack weighted 90 pounds with a camera and tripod. There are benefits to having a mode of transport that thinks for itself and drawbacks. Each individual has its own personality and horses do try to get away with what they can. It is wise to limit your dependence on a horse until you know each other well. In retrospect, I was “out on a limb” riding Colorado modified by being led by someone the horse knew well. It was soon time for me to head back to camp. We set the agenda for the next day, an early start for the hike out. Colorado was to be fully loaded so my riding was not an option, just as well. It was possible to lighten my pack to almost nothing and I looked forward to that. I took some time before dinner to set up the tripod for a self portrait on my last full day in Pine Creek. The view is northeast from the Arizona Trail near my camp, the ridge overlooks Reavis Gap. I did a version of the view with an without me. Click any photograph for a larger image. Here is a gallery of the same photos. It is fun to flip back and forth with me disappearing from the scene. A view of the Arizona trail as it climbs to the Reavis Gap out of Pine Creek. Click me to visit Michael Stephen Wills Online Arizona Gallery. Click me for the first post of this series. These are three galleries of photographs from my Superstition Wilderness postings. You can click on any gallery and page through the photographs. Taken early April, Reavis Ranch, Superstition Wilderness. 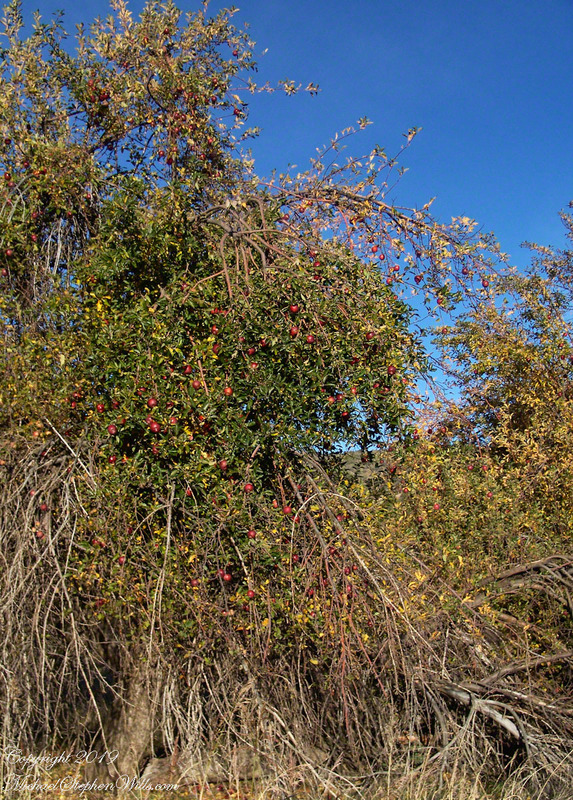 Remnant of a twentieth century orchard, a dream husbanded using a perennial water source. From the slopes of Mound Mountain in the remote eastern Superstition Wilderness. View West-Northwest across the southern Reavis Valley (Reavis Ranch). Pinion Pine and Manzanite in the foreground. “The Searcher’s” horse, Nugget feating on early spring grass among the apple trees of Reavis Ranch. Northeast view across the site and the Reavis Valley. Colorado on the alert while Nugget grazes, typical of their personalities. 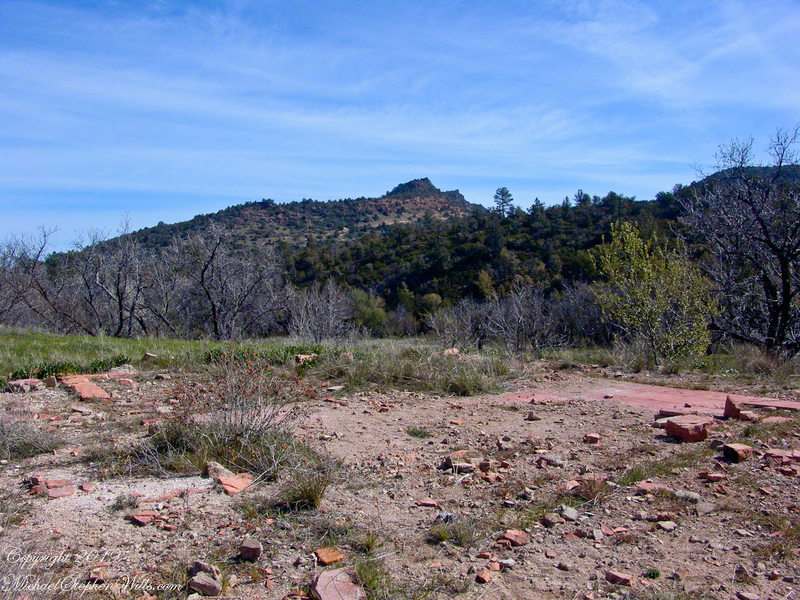 Looking from the former house site towards the Arizona Trail running beneath the distant red rock ridge. Not the fence rails on the left and apple trees in bloom. 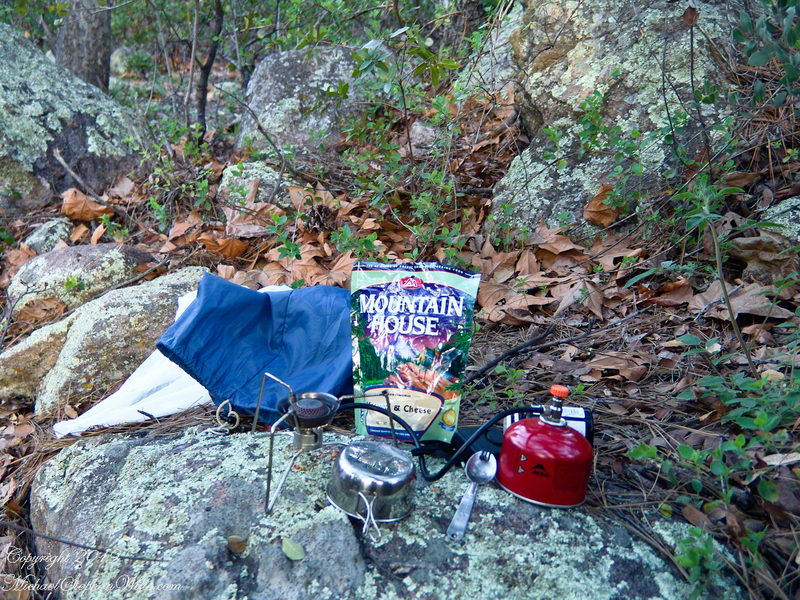 Mike Wills at his Pine Creek Camp, April 2005.
the kitchen: can of fuel, a light burner and dehydrated food. A metal cup and a spork. Looking east toward backpack, center, with unpacked supplies and tent. Tripod at rear. 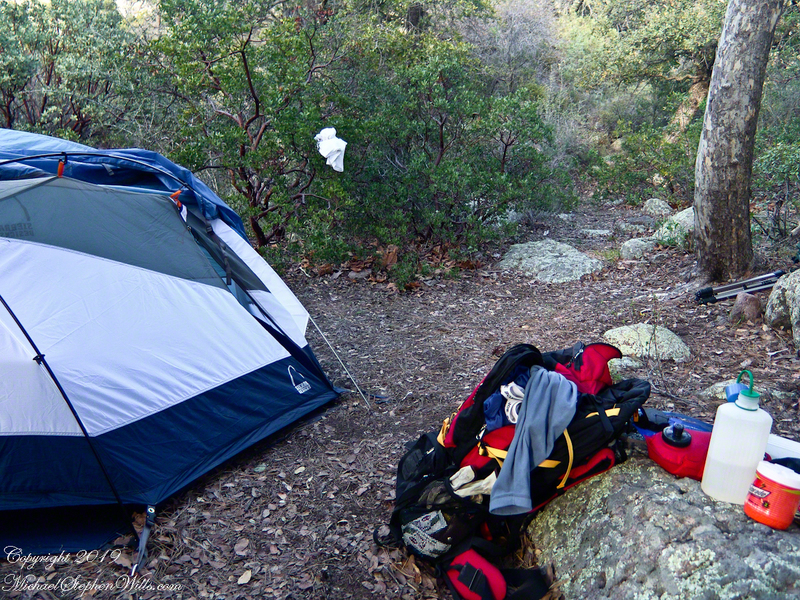 I climbed a large, lichen encrusted boulder for this view of the tent and equipment. Looking south. The following year my sister Diane and I did two expeditions into the Superstitions, March and November 2006. View of a saddle of the ridge to the west over Pine Creek. It is possible to climb over this ridge for a view of Reavis Falls. It is a day-trip bushwack from Pine Creek. View to the southwest on the Arizona Trail above Pine Creek. Pine Creek of the remote eastern Superstition Wilderness hosts this wild Tufted Evening Primrose. From a vantage point overlooking Reavis Gap tot he north. This is the view of Pine Creek, to the south. 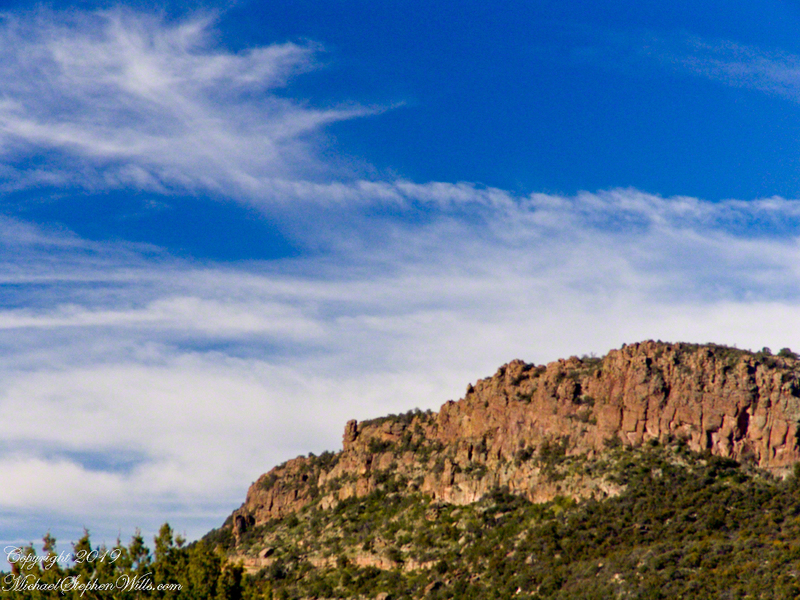 The Arizona Trail passes this spot in the remote eastern Superstition Wilderness. This is the view of my path up from Nameless Canyon. In the distance is the Four Peaks Wilderness Area. 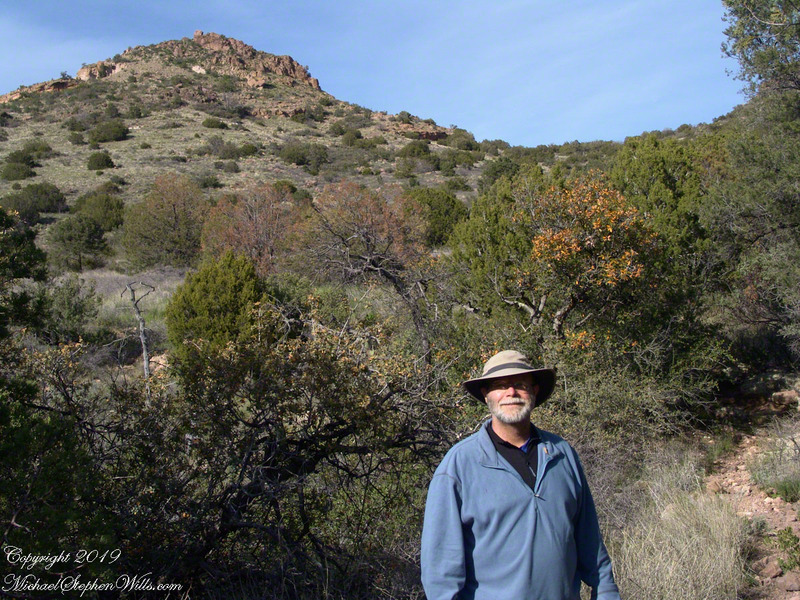 “A This video is from the November backpack, taken from the hill above the Ranch Ruin (Click me for “A Ride to Reavis Ranch”) you will experience the peace of this wilderness valley. View from the western slope of Two Bar Mountain looking west toward Reavis Ranch Trail. Reavis Falls is in canyon on the far side of this ridge. View from the western slope of Two Bar Mountain looking west toward Reavis Ranch Trail. Castle Dome is behind the ridge on right. Fully mature agave surrounded by years of dried leaves against ddawn light in Pine Creen Canyon, Superstition Wilderness, Arizona. Imagine walking across the ranch house ruin towards where I described the former pond. Looking to the east and north from the elevation you see this sight. In the near distance a grass pasture slopes into Reavis Creek. The creek has flowing water in all but the longest dry seasons. By the way, the trail from Pine Creek is on the slopes of that conical feature in the distance, to the left. 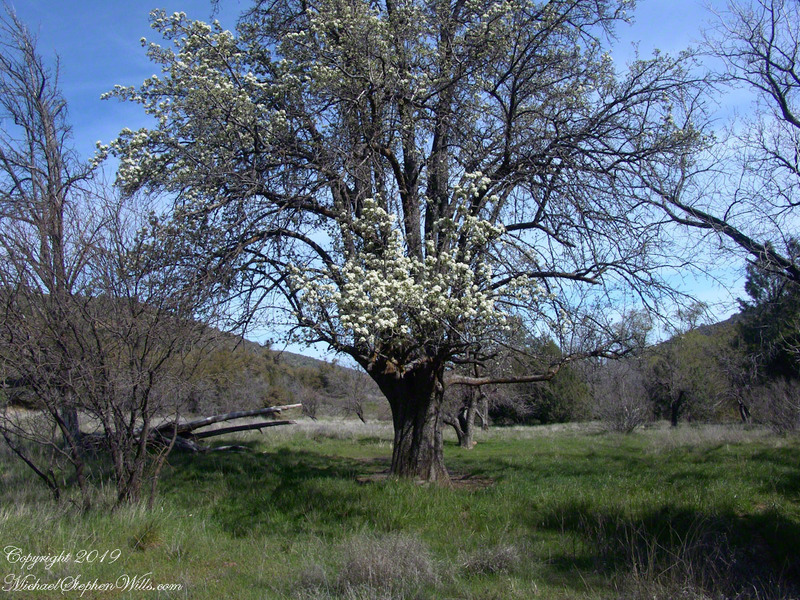 From the ruin, walk down the Arizona Trail, south, for a few hundred feet and turn left into the fields to encounter the same apple tree, and a close up of pure white apple blossoms. This tree is an outlier of a thick stand of several hundred trees to the north. The Searcher and I rode into the middle of the grove for a rest and chat. The horses were allowed to graze in the abundant new grass brought on by the winter rains. The Searcher told me the story of the valley and that it was a man named Clemans who planted 600+ apple trees, trees in bloom all around us. The Reavis Valley was long a site of agriculture, starting in the 19th century with Elisha Reavis, who passed away in 1896 and is buried on the slopes of White Mountain, and continued with a series of ranchers and entrepreneurs in the 20th: John Fraser, William Clemans, who planted the trees, and John A. “Hoolie” Bacon, then Bacon’s son-in-law Floyd Stone who sold the land to the U.S. Department of Agriculture in 1967. We talked about some earthwork I noticed, in the southern part of the valley. It was part of a water system that diverted Reavis creek flow at the head of the valley to the ranch house. We decided that strange hexogonal structure on the elevation above the house ruin was the site of water storage. At that location the structure would provide a pressure feed for the house and much else. 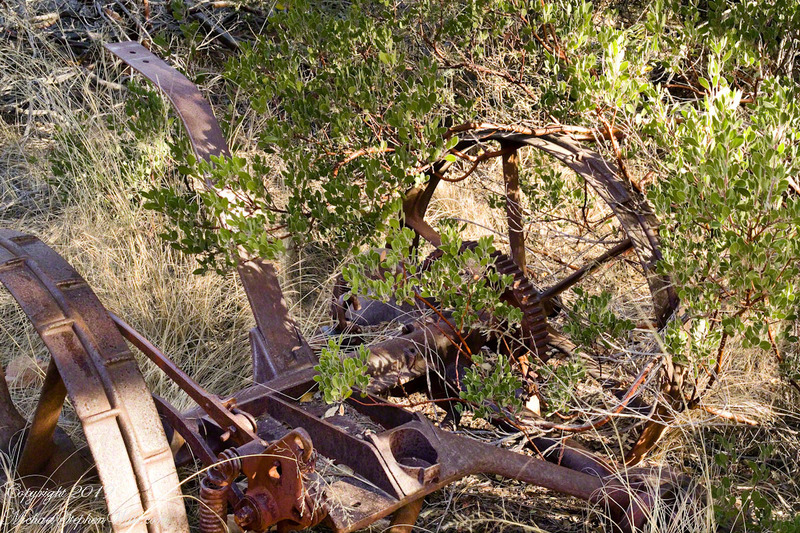 A mix of winter rains and fertile soil were exploited in the Reavis Valley for a handful of decades, the enterprise now is set aside. 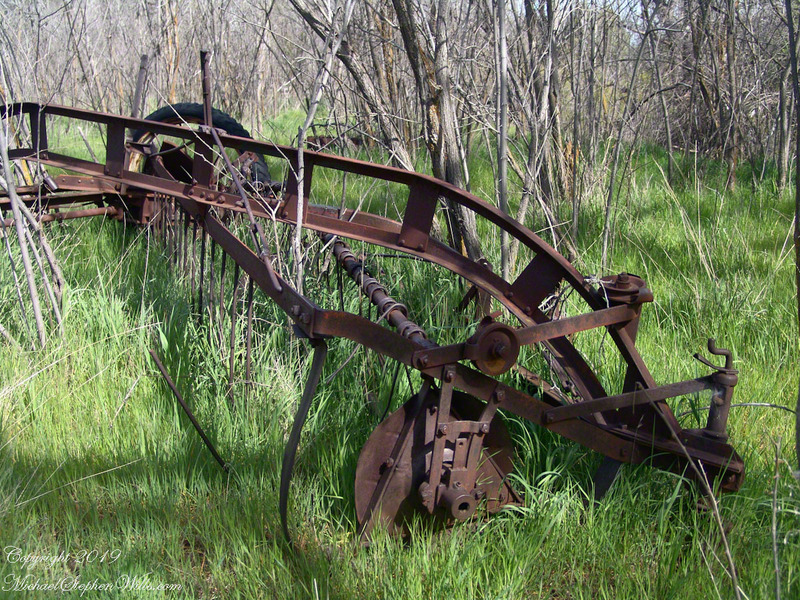 This abandoned hay rake and chassis, used to harvest grass in seasons past, is evidence of the work. 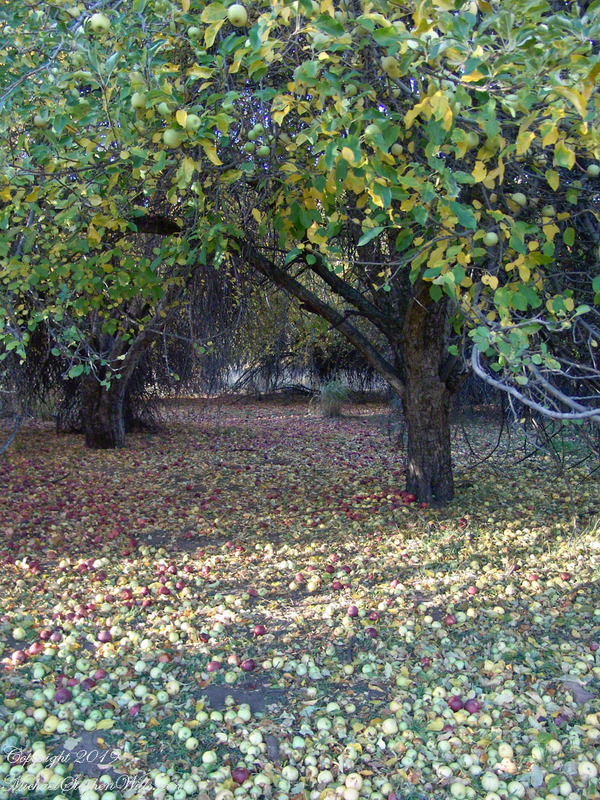 The apple trees produce to this day without irrigation. The Searcher touched upon the subject of the “Circlestone” ruin he mentioned on our morning ride. He had never been there, but mentioned some books on the subject. It is a wide circle of rough stone wall enclosing mysterious structures. At this point, I was hooked, and decided to check Circlestone on a later trip. Here are some photographs from one of those trips, in November 2006. In my next post The Searcher and I return to Pine Creek, Colorado gives me some trouble and we visit a stand of wild oats in the Reavis Gap. Hitching the saddled buckskin and lightly packed pinto onto trees on the trail, The Searcher came up to my camp for a visit. I started water for tea and soon we were chatting. Right from the start The Searcher asked for privacy. Devoted to searching the Superstitions for the gold of the “Lost Dutchman Mine”, he assembles his expeditions from a staging point near Phoenix and spends about 60 days a year in the wilderness. Part of his preparation was a desert survival course provided by the Reavis Mountain School, conducted by Peter Bigfoot. The Search described a place near Pine Creek, he called it “Circlestone,” a large almost perfect circle, of precisely constructed stone wall, on the slopes of Mound Mountain above the headwaters of Pine Creek. My sister, Diane, and I found Circlestone on backpack expeditions March and November 2006. 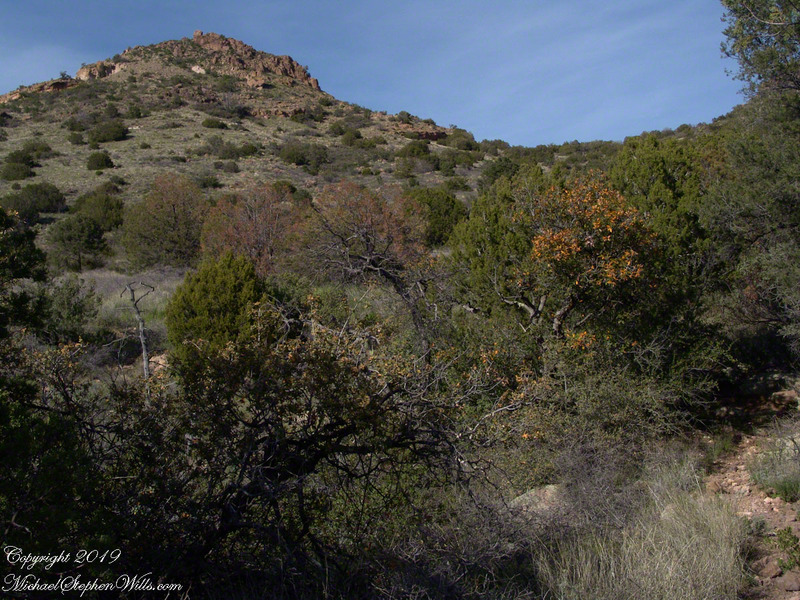 Here is a panorama from March 2006, southwest from the forests of juniper and pinion on the slopes of Mound Mountain.. The southern tip of Reavis Valley is to the right, from there Arizona Trail lead to White Mountain in the distance. It was taken on a later trip, in November of 2006 when my sister, Diane, and I visited Circlestone. The Searcher also told of Elisha Marcus Reavis, who settled the Valley west of Pine Creek in 1874. At one point, a band of Apaches planned to kill Reavis, but were respectful of his reputation as a rifle shot. They were waiting him out across from the his dugout, when Reavis stripped naked and with wild hair and a flaming red beard charge their camp, knives in both hands. The Apaches rode off, wary of his insane behavior, and never bothered him again. We talked about my prospects and plans when The Searcher offered to take me to the Reavis Valley the next day, on horseback. There is a large apple orchard there and, this being April, we’d be treated to masses of apple blossoms. The day after Reavis Ranch, I could pack out with him down the Arizona Trail, past the Reavis Mountain School, over Campaign Creek and drive back to the Lost Dutchman Park. I readily agreed. The following morning dawn rose from colorless darkness, thin birdsong and brightening high clouds. When the Searcher arrived around 8 am he was leading the pinto, introduced as Colorado, equipped with a western saddle instead of a pack. As an absolute novice trail rider, the Search would hold Colorado’s lead. The reins were wrapped around the saddle horn, leaving me to hang on and “enjoy the view” and swishing tail of the buckskin, named Nugget. The 2.5 mile trail to Reavis from Pine Creek is typical of the eastern Superstitions, minimally improved, dramatically uneven with large and small boulders to navigate. From Pine Creek there’s a climb of a 631 feet to 5,278 foot elevation, where it meanders beneath a dramatic red cliff with a view of the pinyon/juniper forests on the slopes of Mound Mountain. As he picked our way, The Searcher pointed out the sights. “Circlestone is somewhere over there, a ring of stones overgrown with Alligator Juniper.” I was able to do little more than observe, photography was out of the question. 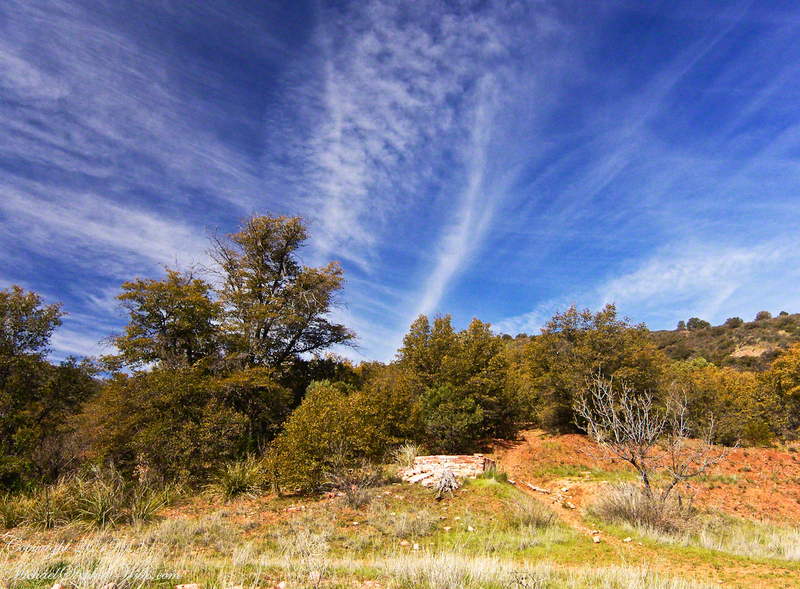 A cliff along the trail to Reavis Ranch offered cover and the flat perches preferred by cougars. It was not an issue for us in daytime and attacks against horses are very rare. The most either of us ever saw of the cat in all our time in Arizona was the tip of a tail slipping behind brush. This was a lush April after a “wet” winter, so small game was plentiful. Only a sick cat would be hungry. The worst case scenario is for a cougar to meet and become infected from a rabid animal at a water source and we did not linger on this thought. Eventually, the cliff descended with the path, steeply, to Reavis Creek, the valley floor and the intersection with the Reavis Ranch trail. Heading south the Reavis Ranch trail passes the site of a long abandoned ranch. What’s left of the adobe and stone ranch house is on a level valley elevation overlooking what used to be the corral and a large open expanse. 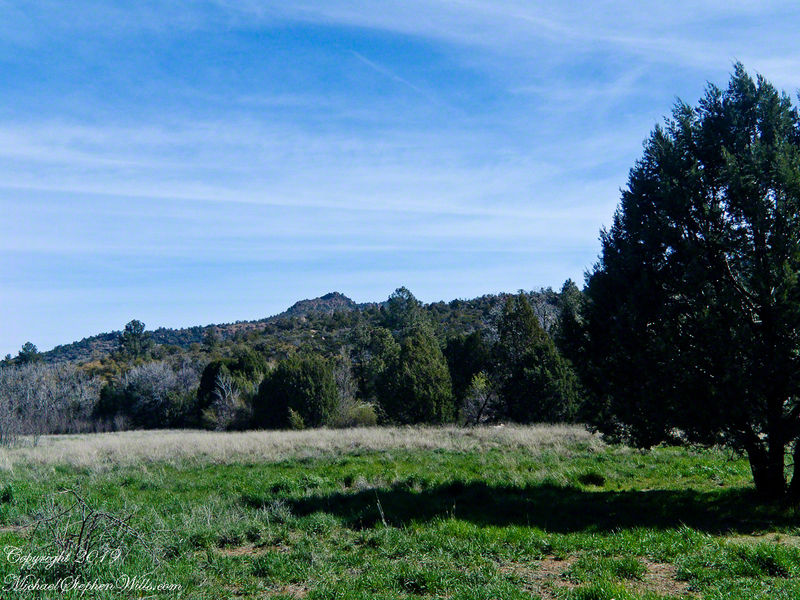 Open field at near the juncture of the trail from Pine Creek with the Reavis Ranch trail. 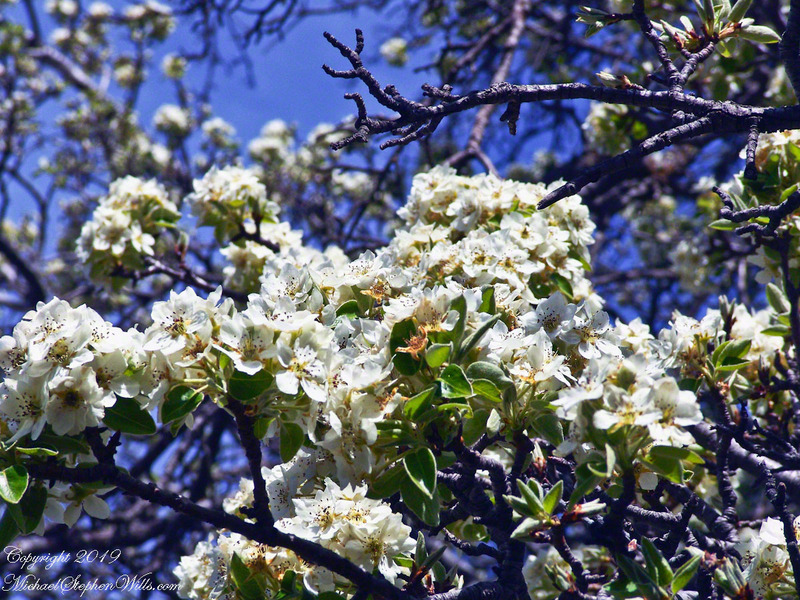 Apple trees in bloom from the former site of the ranch house. There used to be a pond near this spot. With a little imagination, the trail from Pine Creek can be seen on the far ridge. Reavis Ranch Trail, foreground, traverses the valley length north to south. The Arizona Trail from Pine Creek following below the red rock cliffs in the distance. The US Forest Service razed the building after it “burned to the ground” around Thanksgiving 1991. I would not call what is left “a foundation,” it is a platform where the house stood. You can see for yourself in this photograph what was once was a homey tile floor. I’ve seen old photographs of the structure with a large pond to the left of this view, a door and simple porch face east and the pond used to hold irrigation water. Turn around from this ruin and a platform comes into view. Built on the west valley slope, overlooking the ruined house is a hexagonal foundation of adobe bricks. We are looking here across the Reavis Ranch trail. My opinion about this structure rests on an examination of the land to the south, there is excavation of a shallow canal and this was the way water was captured from the upper Reavis Creek or tributary and directed to this catchment basin where it was then directed for storage or irrigation. The spot enjoys clear views of the central valley, an excellent place to enjoy the fall of evening. The Searcher led me to a place a few hundred yards south, in a narrowing of the valley, where he let Colorado and Nugget roam free. 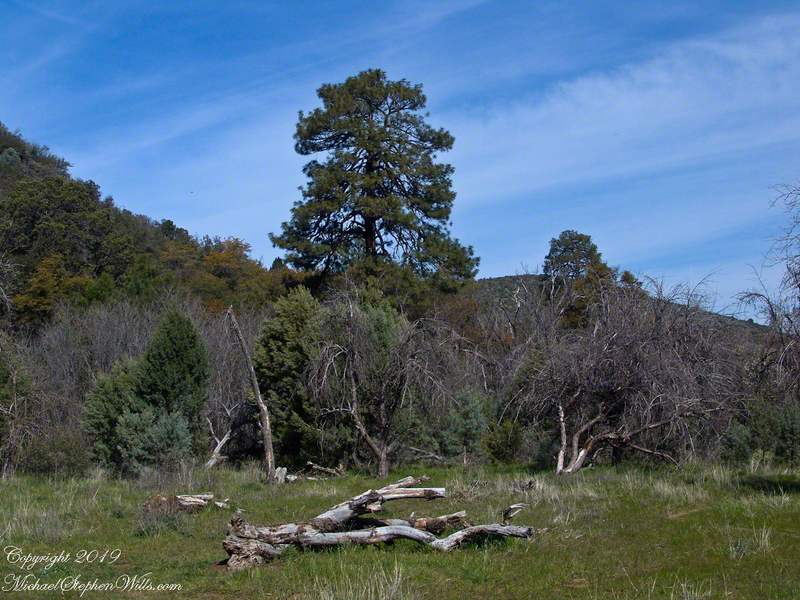 The horses appreciated the level, open spaces and I enjoyed the Ponderosa pines on the west valley slope. We sat on the smooth trunks of fallen trees, 4 feet in diameter, near Reavis Creek. Colorado took this opportunity to bolt, headed south. We took off after him into and through a thicket of locust trees where The Searcher cornered Colorado to regain control. “He was abused by his previous owner and is difficult at times,” was how The Searcher put it. We were close to the end of Reavis Valley where Reavis Creek originates from the drainage of White Mountain, to the west. We headed north here, back to the ranch house site, to the lush new grass of the apple orchard. Nugget grazed unfettered. Colorado was tethered with plenty of slack for grazing. This photograph of the pair shows their personalities, Colorado edgy, Nugget content to feast while the grass is available. 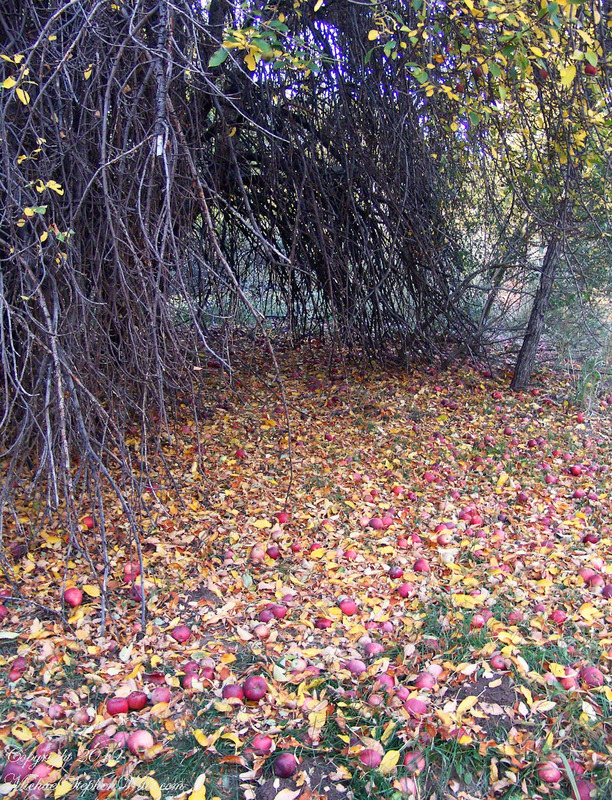 Click me for the next post for photographs and more history of this Apple Orchard in the Superstition Wilderness. My third wilderness evening was unlike the others. 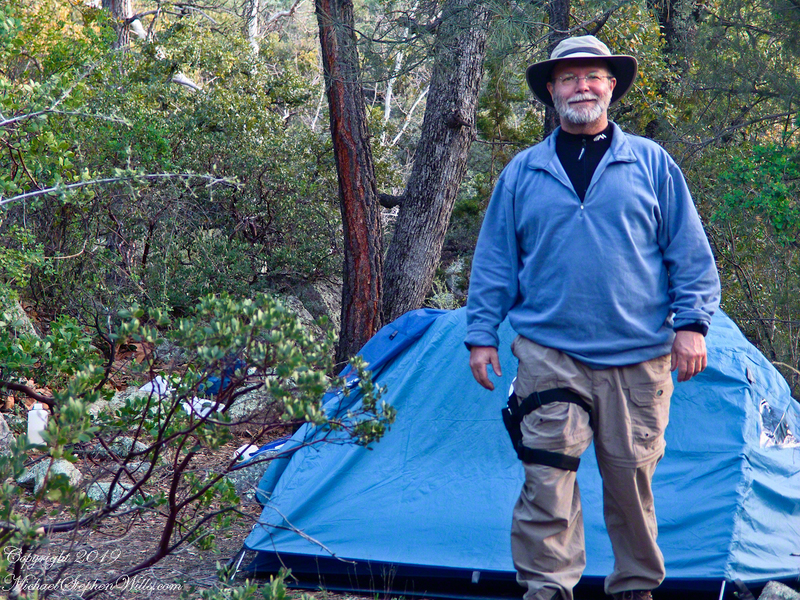 I rested with an unhurried exploration of the camp area. Underfoot was a scatter of dry oak leaves, acorns on hardened desert soil not much softer than the numerous lichen encrusted boulders, all of which formed a bench above Pine Creek. Pumping a gallon of drinking water though the ceramic filter takes more time than meal preparation. The four gallons I packed up were almost used and I enjoyed the luxury of pumping two days supply, 3 gallons in all and planned to down a quart or two of “gator aid” before dinner with the luxurious enjoyment of a flowing Pine Creek for company. 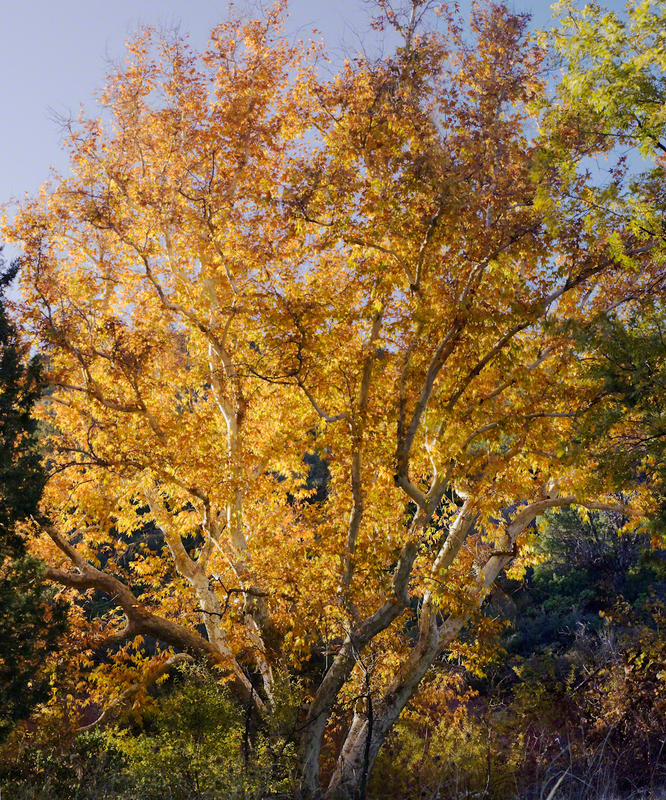 Pine Creek is the most common type for Arizona, recurring. To recur means to happen periodically or repeatedly and, for streams, this means for part of the year no water flows. For these days the flow was low, the water clear, what was left from the plentiful winter rains of 2004/2005. The wind gently rustled the manzanita and the sun just above the western cliffs as I settled on a boulder to enjoy a quart of fluid. I mulled over my next steps. Initially, the plan was to walk across the Superstition Wilderness, starting on the remote eastern end and emerging on the populated west side, in the Lost Dutchman State Park. My sister expected me there on day 10, but today was the end of day three. I didn’t know at that time the climb on my second day was the steepest of the wilderness and the way forward was much, much easier. 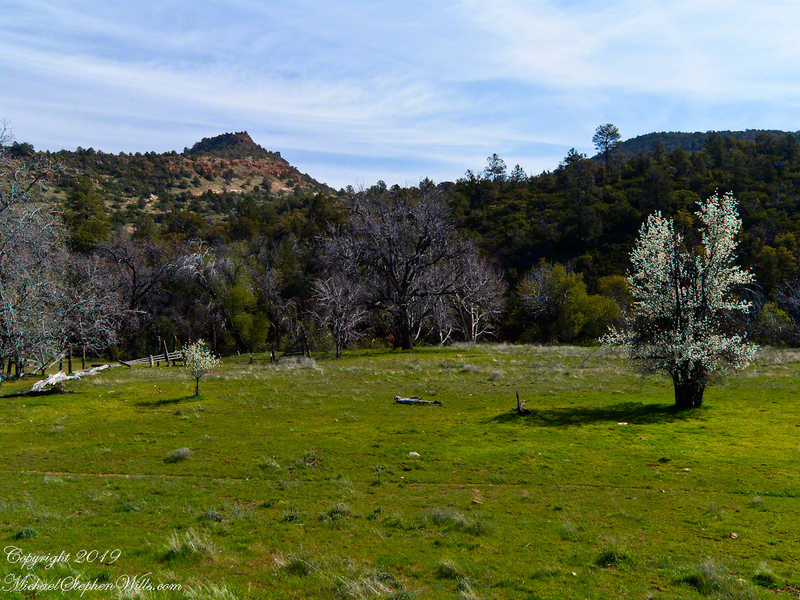 Looking west toward pine creek, manzanita branch foreground and thickets all round, young Ponderosa Pine, Arizona Oak behind tent. Before a decision could be reach, my thoughts were broken by a different sound from the manzanita: several horses approaching on the trail. 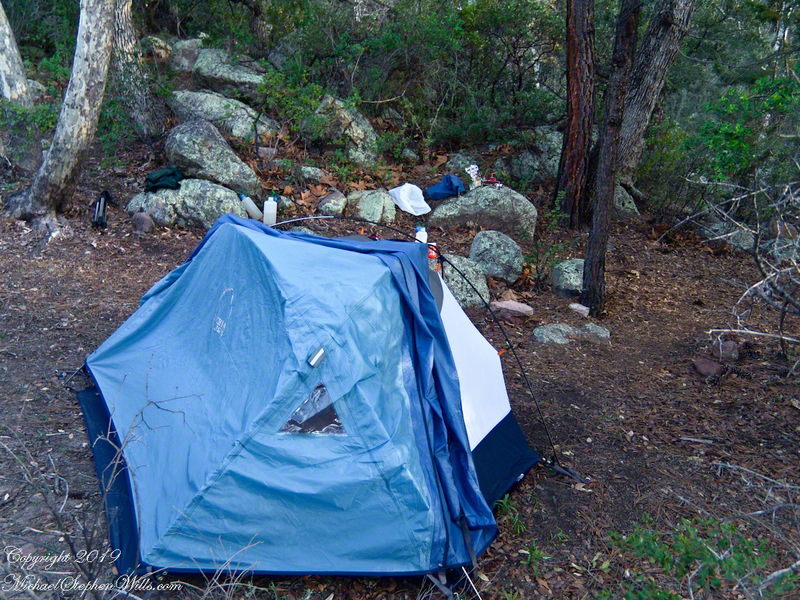 Here is a photographic recap of the previous Superstition Wilderness postings as a gallery. You can page through the photographs. 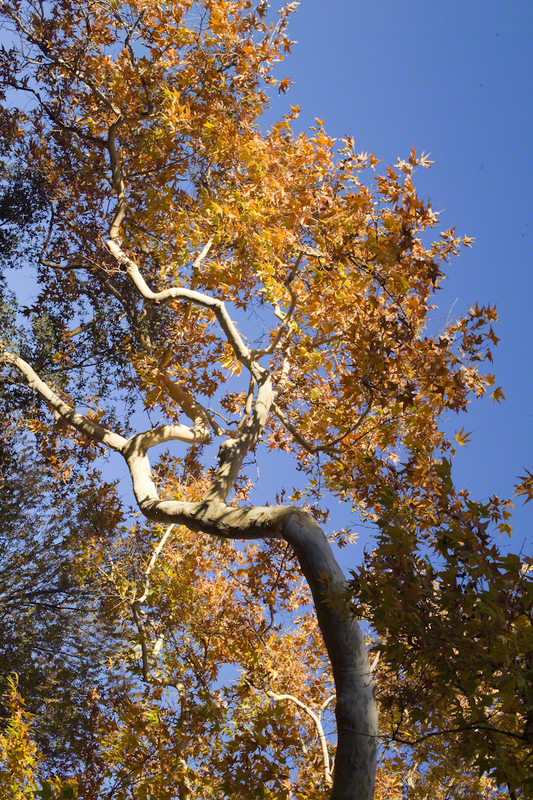 Compare these Arizona Sycamores with the struggling specimen from the last chapter, “A Peaceful Day at Pine Creek.” Many Sycamores such as this one flourish along Reavis Creek, a perennial stream of the eastern Superstition Wilderness. The drainage that feeds Pine Creek is far less acreage than that of Reavis Creek and, when the Pine Creek flow fades in the driest seasons, plants go into survival mode and halt growth and may even slough off limbs to conserve water. 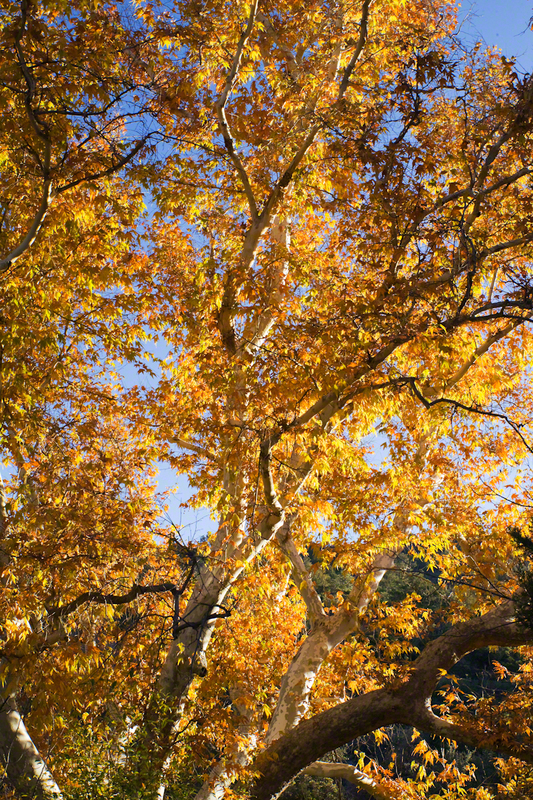 These Sycamores grace a stream that seldom stops flowing, even in the driest of seasons. 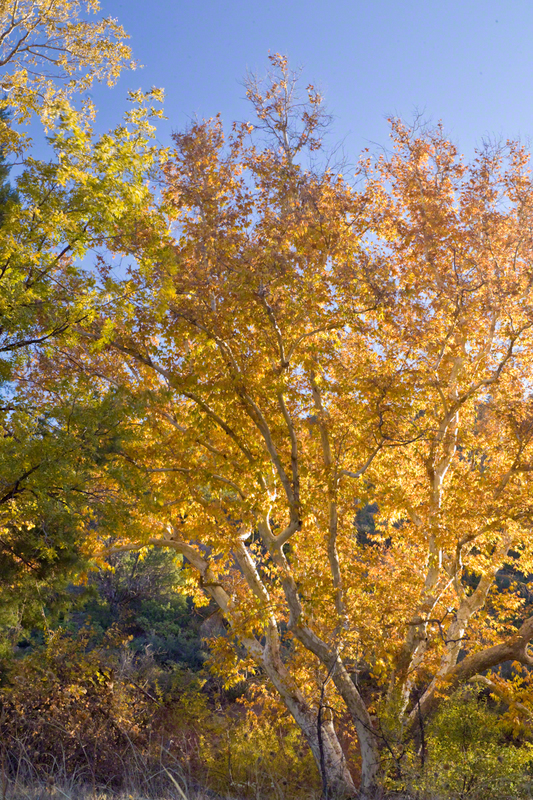 I had the good fortune to visit the Reavis valley of the Superstition Wilderness in November 2007, when these trees were at peak autumn foliage. To encounter a riparian space of the Arizona desert is a revelation, to progress from Sonoran desert spaces assailed by the breath of dry wind, to see the first signs of water in the distance as a welcome fluttering of leaves, to feel a welcome odor of water. Yes, the first effect of a riparian space on the senses is the smell of water. 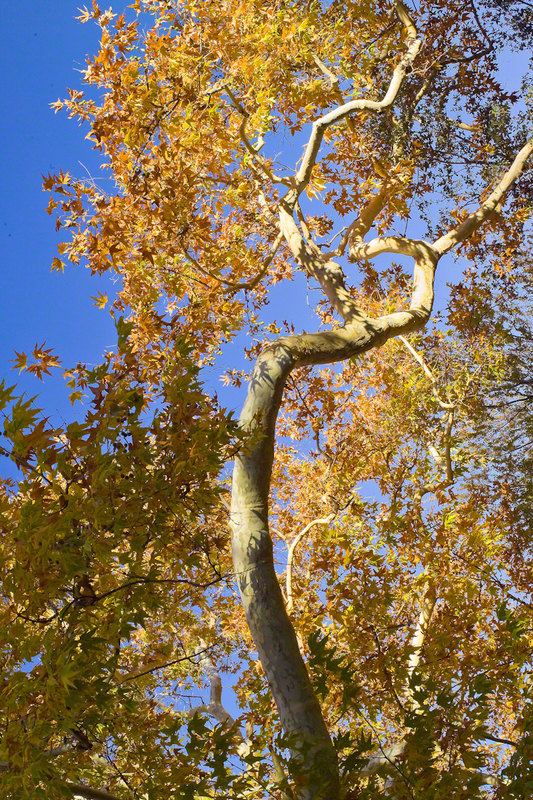 Let’s finish this post with limbs of the Reavis Creek Arizona Sycamore reaching for the sky.